Stars: Luke Evans, Dominic Cooper, Sarah Gadon, Art Parkinson, Charles Dance, Diarmad Murtagh, Paul Kaye, William Houston, Ronan Vibert, Ferdinand Kingsley, Noah Huntley. Universal studios are embarking on a systematic effort to reboot their legendary monster franchises that served them so well in the 1930s. The first cinematic monster off the drawing board is Dracula, although this dark and gloomy take on the character may well have die hard fans of the character squirming, and the likes of Christopher Lee, who played the suave blood sucker in a series of camp films for Hammer studios, spinning. As written by Matt Sazama and Burk Sharpless (the forthcoming epic Gods Of Egypt) this is a fanciful take on the legend of Dracula, first created by Bram Stoker in his classic novel that has stood the test of time. The muddled script purports to explore how Vlad The Impaler became the legendary undead prince of darkness, but it basically ends up turning him into a hybrid medieval superhero. 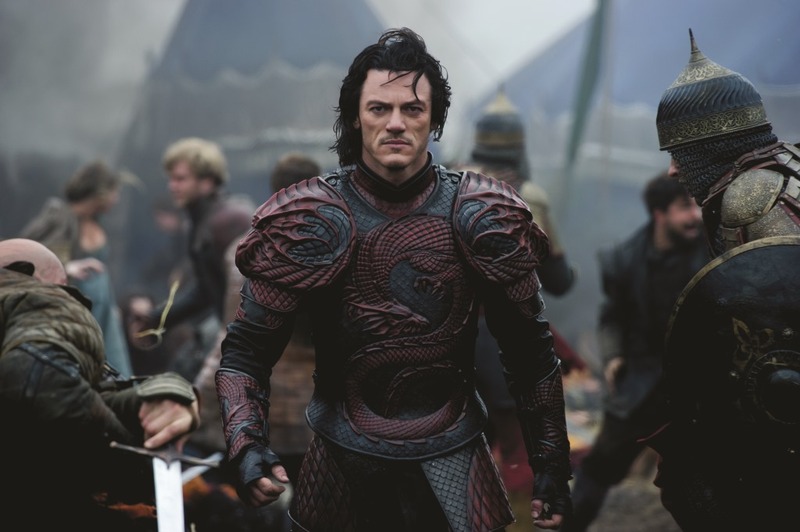 Vlad Tepes (played by Welsh actor Luke Evans, from The Hobbit, Immortals, etc) is the legendary and bloodthirsty medieval king of Transylvania who gained notoriety for impaling his enemies in battle. But now he has ruled over a period of peace and prosperity for his people. But that is threatened when Mehmed the Second (Dominic Cooper), the new warlord of Turkey and former childhood friend, demands his tribute of silver. He also wants to restate the practice whereby his subjects give up 1,000 teenage boys to become part of his army. Vlad once used to be a child soldier in the sultan’s army – that’s how he established his fearsome reputation in the first place – and he knows at first hand how harsh and cruel that life can be. He refuses to give in to the demand or hand over his son to this form of servitude, and instead kills four of the warlords emissaries. The scene is set for a bloody war between the two nations. Outnumbered, Vlad turns to the sinister and ancient vampire (Charles Dance) who lives in the caves in the nearby mountains. He does a deal to briefly become a shape shifting and invulnerable warrior with the strength of ten men, to help defeat the Turks. Only catch is he must not drink blood for three days otherwise he will turn into a vampire permanently. With his wife Mirena (Sarah Gadon, from A Dangerous Method, etc) and young son Ingeras (Art Parkinson, from Game Of Thrones, etc) in danger, Vlad makes the ultimate sacrifice to try and protect them. Dracula Untold is the first feature film from Irish director Gary Shore, a former director of commercials, who bathes the material in buckets of blood and gloomy visuals but it is unevenly paced. Shore seems to have little flair for action, and most of the action sequences are shot in that annoying, overly edited and kinetic style that renders them virtually incomprehensible and unwatchable. And cinematographer John Schwartzman has shot the film in widescreen, but he has also shot the thing in very dark and murky tones. Visually the digitally created sets, the epic battle scenes and backdrops seem second rate. The special effects that transform Vlad into a furious swarm of bats are also second rate and unconvincing. They have a heightened sense of unreality about them, resembling the artificial visuals of films like 300, etc. The film also seems to have been largely influenced by video games and comic books. And it seems as though the popular HBO series Game Of Thrones also has a lot to answer for because it also is a major influence on the look and feel of this film. Over the years Dracula has been played by a number of actors, most of whom have brought their own distinct take on the character. By far the best was Christopher Lee in those Hammer horror films of the 60s and 70s. Evans has a strong physical presence in the lead role, but he depicts Dracula and Vlad as a flawed hero who wrestles with the conflict between his need to protect his family and his bloodlust. His work here as a brooding and driven hero seems like good preparation for his role in the forthcoming remake of The Crow. As Mehmed, Cooper perfects his Alan Rickman sneer but he is otherwise a fairly conventional and one-dimensional villain. Gadon is certainly a strikingly beautiful screen presence given little of consequence to do. Dance delivers his dialogue with his usual silky, seductive menace, although he is buried under layers of prosthetic makeup that make him look like a distant cousin of Harry Potter’s nemesis Voldemort. Dracula Untold is nasty and overly violent with a high body count. But it also such a messy and visually ugly origins film that I wish it had remained untold! And on the strength of this first new outing for Dracula, it seems unlikely that anyone will be in a hurry to see a second installment.